The Kalleske's are one of the region's leading grapegrowing families, providing world class Shiraz fruit for Penfolds Grange over many vintages, consistently growing some of the Barossa's best quality grapes. 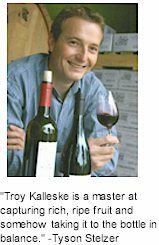 After five generations of growing grapes, winemaker and sixth generation family member Troy Kalleske established the Kalleske winery and created the Kalleske label. The winery is situated on the family estate where open top fermenters, basket press and barrel store ensure the vineyard realises its full potential as wine. The vineyard is managed by Troy's father fifth generation grapegrower John Kalleske, who has over forty years experience tending the vineyard. The 120 acre vineyard is planted to Shiraz, Grenache, Mataro, Cabernet Sauvignon, Durif, Petit Verdot, Semillon, Chenin Blanc and Viognier. Vines vary in age with the oldest vineyard dating back to 1875 and an overall average vine age of about 50 years. The vineyard is low yielding and all grapes are grown organically. Following university, Troy was a graduate winemaker with Southcorp where he gained valuable experience with stints at Seppelt Great Western, Lindemans, Penfolds and Seppeltsfield fortified winery. On completion of the graduate winemaker program, Troy continued winemaking for Southcorp at Penfolds, Barossa Valley. Troy has also completed a vintage with Veritas Winery and Miranda Wines, and in keeping with the increasingly global wine business he left Australia and gained valuable international knowledge of the industry as Harvest Enologist for Kendall-Jackson at Vinwood Cellars in Geyserville, Sonoma County. In 2002, after 149 years of farming and grapegrowing by the Kalleske family, Troy took the next step and established the Kalleske winery. Troy is responsible for all winemaking, management and day-to-day operations of Kalleske Wines, while his father, John, continues to manage the family vineyard which he has looked after for over forty years. There are five wines in the Kalleske range. All wines are estate grown and vinified with minimalistic winemaking techniques used to fully capture the essence of the vineyard allowing genuine hand made estate wines to be produced. Clarry's Barossa White is a blend of Semillon and Chenin Blanc and its partner Clarry's Barossa Red is a Grenache Shiraz blend. The Greenock Shiraz is a single vineyard wine, made from a superb Shiraz block on the Western edge of the Greenock Creek. The Old Vine Grenache is from a small dry-grown vineyard planted as bush vines on the Kalleske farm in 1935 and the Johann Georg Shiraz is made from a dry-grown vineyard planted on the farm in 1875.